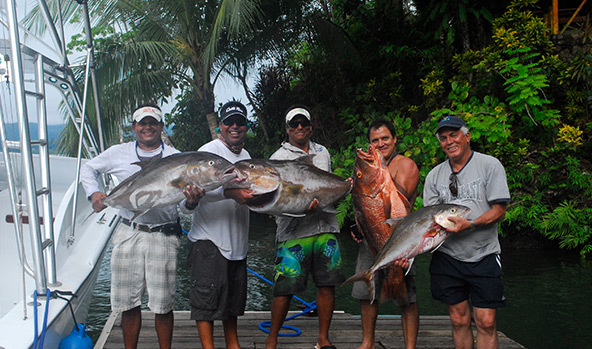 Fishing off the Osa is brilliant – a truly amazing experience that you’ll never forget. 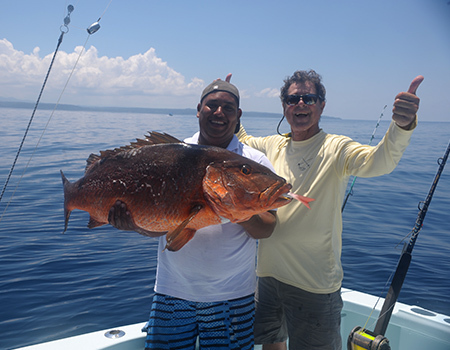 The Osa is where you want to fish and Águila de Osa captains are who you want taking you out. 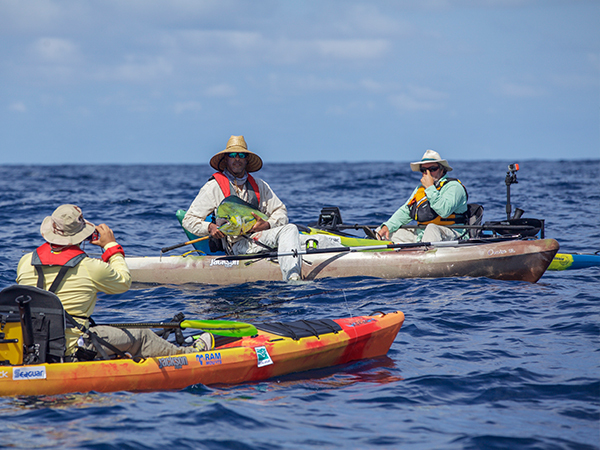 We’ve been fishing these waters for more than 20 years, and over that time Águila’s captains have set four IGFA world fishing records. 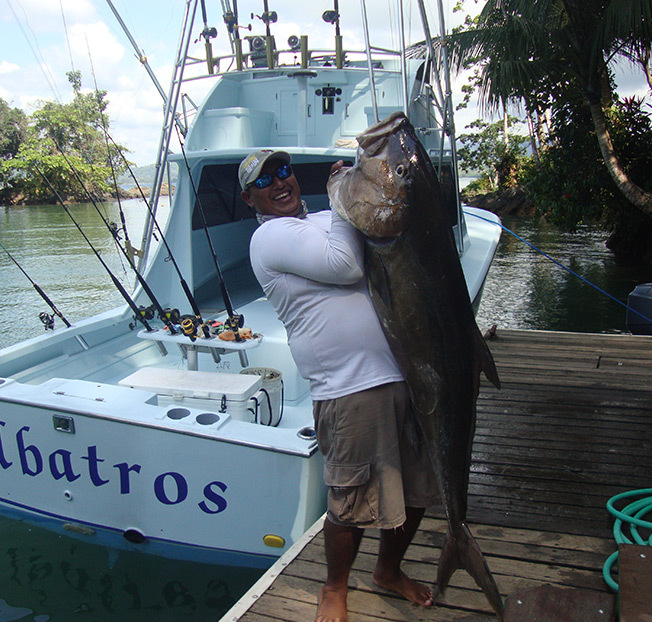 We’re passionate about this sport and even more passionate about making sure you have an exceptional Costa Rica fishing experience with us. 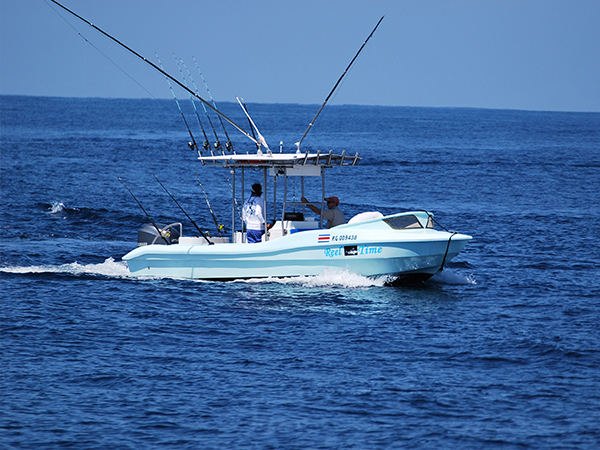 Includes: 26′, 31′, and 35′ custom sportfishing boats and experienced fishing crew, rod and reels, lures, and bait. Note: fishing license not included. Activity level: Easy to challenging – depends on what’s on the end of your line! Cold beverages, and picnic lunch are served on board. We recommend bringing a water bottle, as well as sunblock, a hat, long-sleeved shirt, short pants/swim suit or light-weight long pants to protect yourself from the tropic sun. Where We Go and What We Chase? 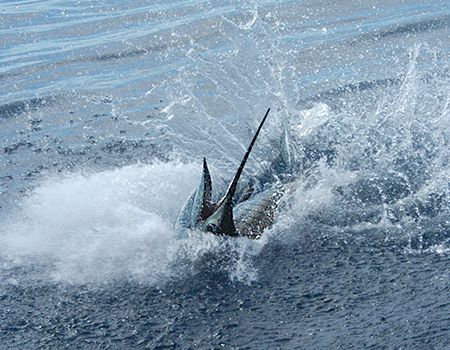 On our full day charters, you’ll chase the runs of big Blue and Black Marlin, as well as Sailfish, which range from 20 to 60 miles out. 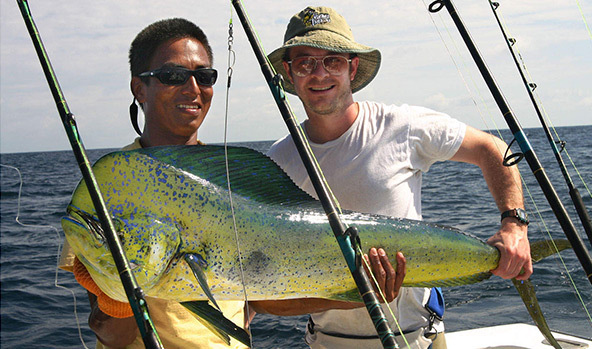 On the way, we look for the huge schools of spinner Dolphin to find the big Yellow Fin tuna and Dorado (Mahi-mahi). Our half-day charters are closer in, where you can troll around Caño Island for Wahoo, or jig on the rock mounts for Cubera Snappers, Amberjacks, and Grouper. 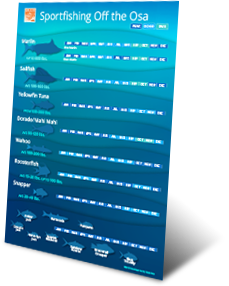 There are also half-day charters for in-shore trolling, casting surface plugs or live bait for Roosterfish, Sierra or Spanish mackerel, and Snapper. So whether half-day or full day, you’ll often be in the company of dolphins, sea turtles, rays, flying fish, and during seasonal migration —majestic humpback whales. The Osa is our home and these waters are special to us all. 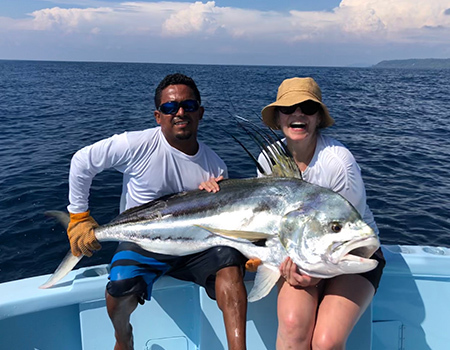 With Caño Island is just 12 miles off Drake Bay, and to the south, the spectacular cobalt blue waters off the coast of Corcovado National Park, there is relatively little fishing pressure in these areas, and we’re keen to keep it that way. 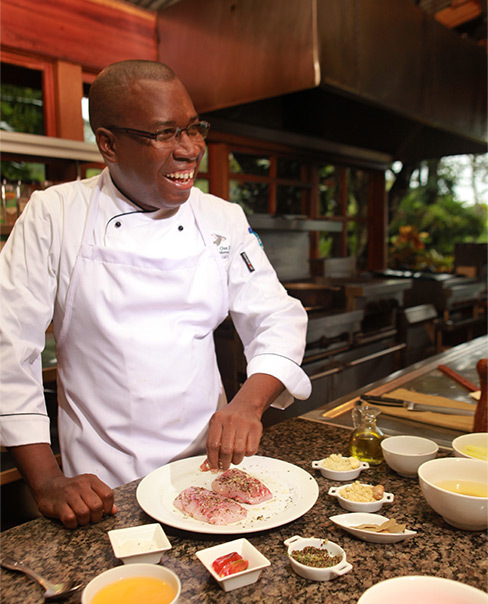 Our philosophy is simple — eat what you catch or let it go. We are the first charter operations on the Osa to commit to catch and release using circle hooks. On the flip side, hand-off your catch to Chef Dixon and you and your party will be feasting like King Neptune come dinnertime. 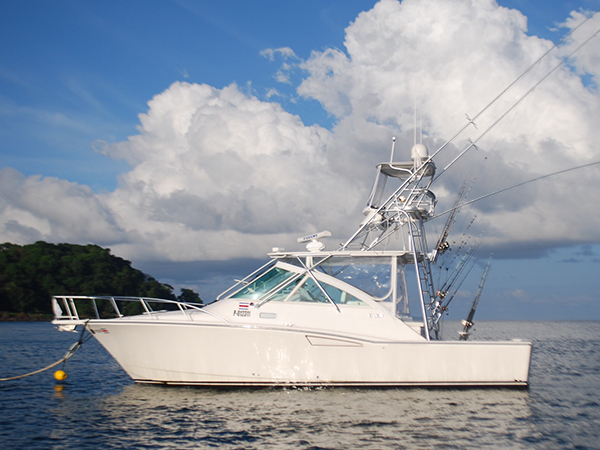 With all the great fishing happening off the Osa right now, Aguila is offering three outstanding boats to choose from – a 35’ Cabo, 31’ Palm Beach, and a 26’ center console, specially built for the local waters. All boats meet all U.S. Coast Guard safety regulations and are fully equipped with life jackets, flares, GPS, and in case of emergency, our VHF radios featuring a special frequency that enables us to reach significantly farther distances than the typical marine radios. All boats are maintained to the highest standards to ensure your total safety and enjoyment. The Aguila fleet uses only top-of-the-line fishing equipment, Penn internationals, Tiagra and Shimano reels with custom made rods in all weight classes. 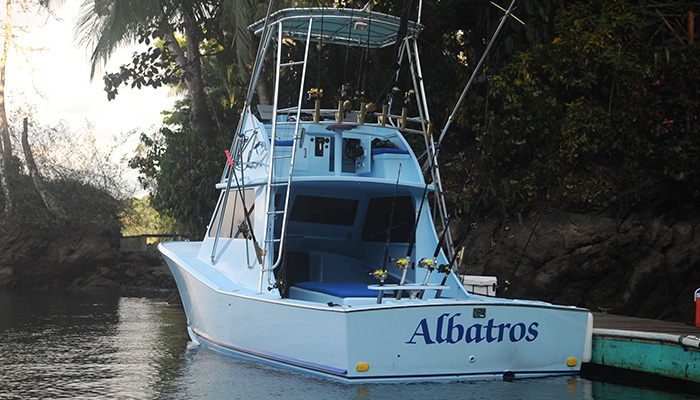 Albatross is a Palm Beach 31-foot cold-molded sport fishing boat, with a bathroom and plenty of shade. It’s powered by a Caterpillar 3116 turbo diesel. The Reel Escape is a 35-foot CABO sport Fishing Yacht powered by Caterpillar twin 450 hp turbo diesel engines. The boat is fully equipped for your comfort and safety, with an air-conditioned salon, a full bathroom, and kitchenette. Reel Time is another great boat for inshore fishing. A throaty 250hp, 4-stroke Yamaha powers this unique new 26 foot center console walk around. Note to fly fisherman: We will gladly accommodate you on your fly fishing adventure. However, we ask you to bring your own rods and flies.